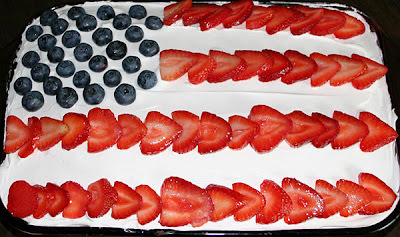 Old time favorite 4th of July recipes are always ones we make year after year. 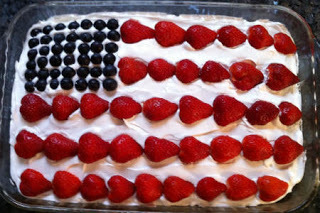 Here's a super easy one - the 4th of July Poke Cake made with Jello gelatin, cool whip whipped topping, and fresh blueberries and fresh strawberries. Share this cake recipe with a Friend! 1. Prepare an ordinary white cake mix according to box directions. Use a sheet cake (9x13) baking pan. 2. Wash and clean strawberries and blueberries, set aside. 3. Slice the strawberries and set aside. 4. Prepare dry gelatin. I normally use about ½ cup less water, when preparing. I like it to be a little thicker than normal. 5. Allow cake to cool for apx 15 minutes, then carefully poke holes into the cake with a chopstick every inch inch or so. Holes should not go all the way through cake to the bottom of the pan. The entire cake should be perforated. 6. Pour cooled gelatin liquid evenly over entire cake. Holes in the cake allow gelatin to seep into the cake. 7. Refrigerate the cake 4 hours or until firm. Spread cool whip or whipped topping over the entire cake. 8. Arrange strawberry slices on whipped topping for 'stripes' . Store leftover cake in refrigerator, if there’s any remaining. Some printables on this website are .pdf files. You'll need to have Adobe Reader installed on your computer to view and print .pdf files. Most computers have this software installed already, if you do not you can download Adobe Reader free here.